■ A proper air/gas mixture is required for any burner to have an efficient oxidative (blue) flame. Most burners use a pipe burner venturi (air/gas mixer) to get the proper air gas mixture, as do ours. Stove burners on your stove top, oven, grill, dryer, water heater, and central heating furnace also have an air/gas mixer even though the venturi may not be visible to you. 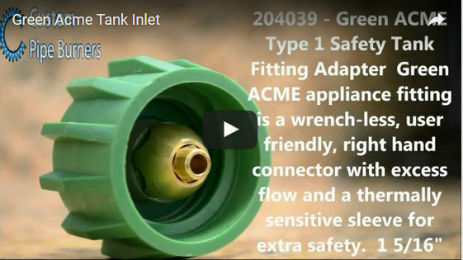 ■ If the burner is installed into a closed appliance the pipe burner venturi needs to be outside of the cooker or able to get an adequate air supply into the venturi. There also needs to be an air source available to get to the flames of the burner. This is available to all of the appliances that were mentioned in the previous paragraph. The air source for the flame is best if it comes from underneath the burner and for longer burners should extend most of the way down the length of the flame. ■ An example would be if you put a 5’ pipe burner inside of a smoker pit with the venturi outside of the smoker. If you have one air hole towards one end of the burner, that side may stay lit while the other side may extinguish due to lack of air. This is why it is important to test the burners prior to installing them inside of your cooker. If the burners were operating properly outside of the cooker, but when installed inside the cooker they fail to operate properly, the problem most likely has to do with the air flow surrounding the flame and/or exhaust from the flames. ■ An exhaust stack is required for the appliance. If the appliance does not have an adequate exhaust, then the gases produced by the combustion will build up within the appliance and prevent fresh air from being able to get into the cooker. This will cause the flame to be extinguished. One thing to keep in mind is that heat will go towards the exhaust. Where you put your exhaust is important and must be considered in your design. 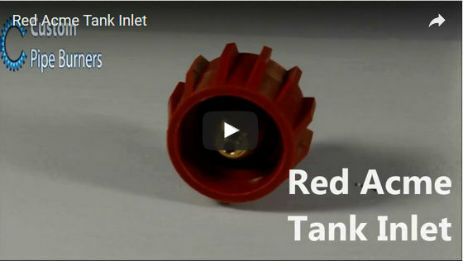 ■ Be sure that all valves are closed prior to making a gas connection to the burner. If more than one burner is present, then you will want to light and adjust the burners one at a time. ■ It is best to try to light the burners in an open area prior to first installing them in your appliance. This may need to be a darker setting so that the flame can be visible. It is more difficult to see flames in a well-lit area. The area should be free from tripping hazards, constantly moving air, flammable objects, and other similar hazards. The area that the burners will be tested at should also have an adequate amount of ventilation. All leak tests should be done prior to an attempt at lighting the burner. 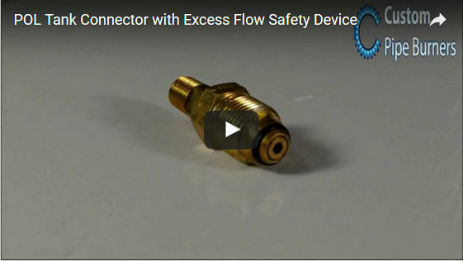 A gas shut-off valve should be readily available to shut off the gas in case of emergency. ■ The air shutter on the venturi should be closed as much as possible prior to lighting the burner. A slight amount of gas should be allowed to flow into the burner for a few seconds, then using a long lighter, match, or striker ignite the holes closest to the venturi. The flame should light all the way or most of the way down the pipe. The flame may be a yellow flame. 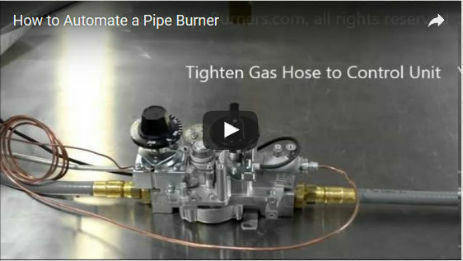 You will want to turn the gas flow up to allow more gas into the burner. This may produce a larger yellow flame. At this point you will want to slowly open the air shutter until the flame turns completely blue. If the flame is still yellow more air needs to be given to the venturi. If the flame starts to lift off of the burner then the air needs to be reduced to the venturi. Changes in the amount of gas given to the burner may require a need to adjust the air flow through the venturi. Sometimes, turning the gas up actually results in the air needing to be reduced, because the pressure of the gas is drawing in more air into the venturi than it was previously. 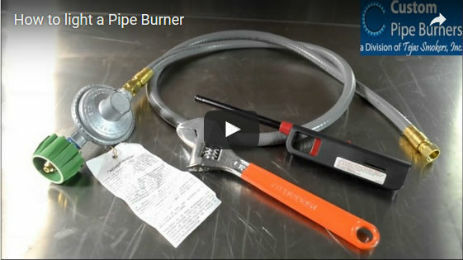 ■ Pipe burners can be setup for high pressure propane, low pressure propane, or natural gas. ■ The number of burners that you would need would depend upon the intended use. For smokers and smokehouses, the number of burners would vary based upon design and temperature range. We recommend that you contact us to help determine what is the optimal setup for your particular application. We can custom make pipe burners with other diameter pipe or stainless steel pipe. ■ Our stock pipe burners are made out of 1 ¼” ID schedule 40, new black pipe which is thoroughly cleaned inside and out. The outside diameter of the pipe is approximately 1.7”. The measurements of the burners are the lengths that the pipe is cut and will have 8” of undrilled pipe before the flame holes begin. For example, our 56” pipe burner is cut at 56”; one end of that is threaded and there is 8” from the beginning of the threaded end that does not have any drilled holes for flames. The holes then run to the opposite end of the burner where a flat cap is welded on. ■ All of our burners are carefully bench tested and flame optimized prior to shipping. ■ Failure to install gas equipment properly can result in an explosion or fire causing serious injury or death. All components should be installed according to Local, State, and/or Federal codes. A licensed gas technician may be required to install certain components. 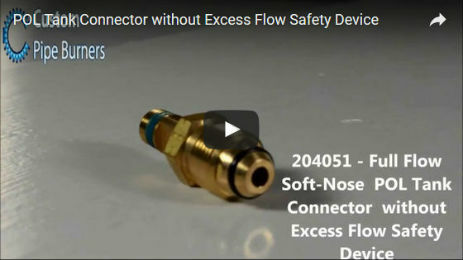 All connections should be leak tested prior to use and periodically checked to be sure their integrity is secure for continued use. Most components may only be installed for outdoor use. on Facebook this with your friends. Thanks! 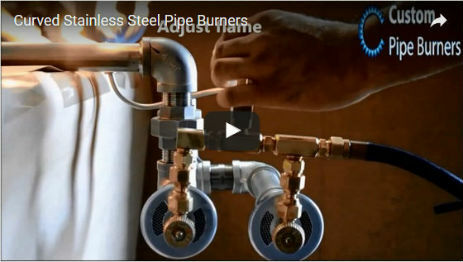 CustomPipeBurners.com is your source for pipe burner facts and information, well built pipe burners, and gas specialists who will help you. Free shipping to California and Michigan - to all 48 contiguous U.S. States.